Beat the clock with dinners that rock! 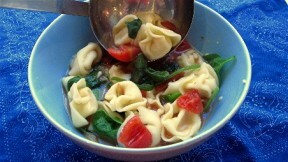 Take on the challenges of eating together despite busy schedules and picky eaters with this delicious twenty minute tortellini soup recipe from Aviva Goldfarb of The Six O'Clock Scramble. See the full post at Kitchen Explorers.